This year, union members from all walks of life and every community in America shared their stories with newspapers and on TV and radio. They sent a message: unions are an important part of our communities and they’re standing strong in the face of attacks. 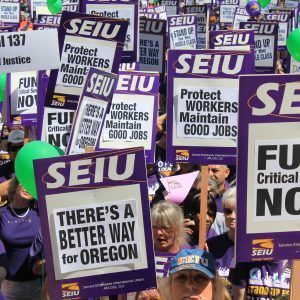 Here are some of the best stories we’ve collected from SEIU members and allies here in Oregon. Thankfully, a friend told my mother about training for an in-home care program. At 18, I became her home care provider. It happened to be the same time that home care became a union represented job. Since then, I’ve seen my wages steadily increase with each contract. Year after year we gain more respect for our work: a living wage, paid time off, workers compensation, health coverage, paid trainings… The list goes on. Unions have been essential to fighting back against discrimination in the workplace while pushing for civil rights and closing the gender pay gap. 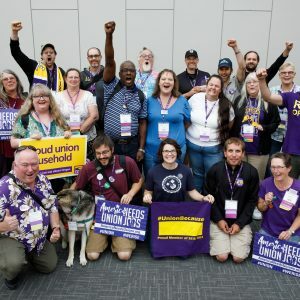 Even before marriage equality was a national issue, many union collective bargaining agreements prohibited discrimination based on sexual orientation and allowed for domestic partnerships to be recognized in healthcare plans. 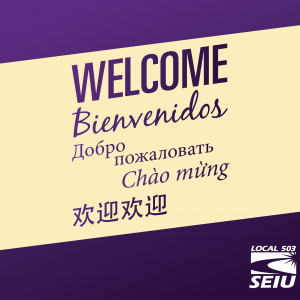 These issues go beyond the workplace, and it’s one of the many reasons I’m a proud SEIU member. The healthcare plan that my union contract affords me saved me from personal and financial hardships that I don’t want to imagine. And it meant I could get better and continue providing care to the five veterans that I have had the honor to care for here in Oregon. I have a union. Together, my coworkers and I have the strength to lift ourselves up, raise wages, and fight for good benefits. It’s been life changing.